Custom Actions lets to customize Sharepoint Ribbon UI, you can add your own buttons, groups & tabs to the Ribbon UI of sharepoint. You can also customize various context menus provided by Sharepoint. Setting Rights on custom actions lets you control the availability of the custom action to the end users based on their Roles. Following Roles are available in Sharepoint 2010. Refer to http://msdn.microsoft.com/en-us/library/microsoft.sharepoint.spbasepermissions.aspx for more details on Rights. We’re going to use the custom action created in the previous article and add a permission mask so that the custom action is available only to those users who has Manage permission on the list. 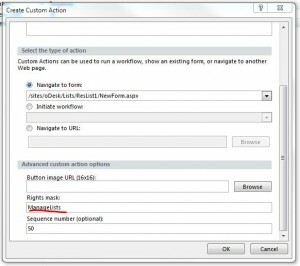 Users with permission level below Manager will not see the custom action in the context menu. To restrict permission to only manager, we need to use ManageLists permission mask. This permission mask will let the custom action to appear only for the users who has Manage permission on the Sharepoint list. 2. Press Open Site and enter URL of your sharepoint site, you need to provide the credentials to connect to the site. 7. Type ManageLists in Rights mask textbox. That’s it, save your changes in sharepoint designer 2010 and refresh your sharepoint site. You can see your custom action by selecting a list item and opening the context menu. The custom action will appear only for the users who has Manage rights on the Sharepoint list.